Shane Gibson 1970 - 2014. 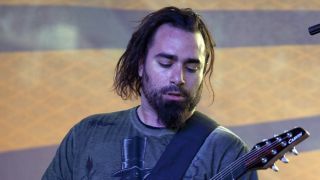 Shane Gibson, who from 2007 to 2010 was a touring guitarist with Korn, died today from complications due to a blood clotting disorder. He was 35 years old. After Brian "Head" Welch left Korn in 2005, the band hired various touring guitarists rather than seek a permanent replacement. Guitarists Rob Patterson and Sevendust's Clint Lowery briefly worked with the group, but Gibson's three-year stretch was the longest. "It is with deepest sadness and regret that we must confirm that stOrk founding member and lead guitarist Shane Paul Gibson passed away at 5:45 AM on April 15th, 2014 in the UAB Hospital in Birmingham, Alabama as a result of complications from a blood clotting disorder. He was 35 years old. He was one of the best guitar players the world has ever known and his virtuosity was matched only by his wit and generosity of spirit. He will be missed beyond measure.